technique best suits your requirements. 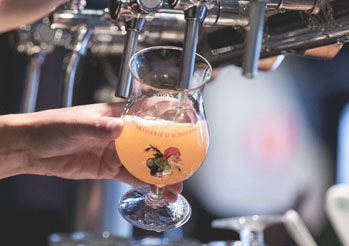 With our advanced machinery, we can even decorate square or oval glasses and bottles so we can meet every decorating challenge. This way we can provide you with the design that fits your brand’s marketing. We would like to discuss the different possibilities and designs with you. Feel free to contact us without obligation. 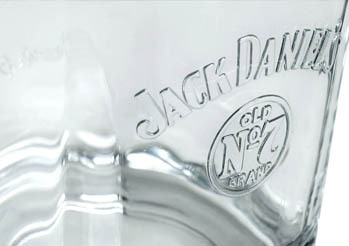 Screen printing is the most widely used glass decoration technique. 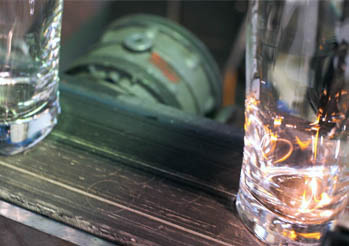 With this technique, the glassware is loaded into the machine, after which ceramic ink is directly printed on to the glass via a screen and a blade. The ink consists of finely ground glass, colour pigments and paraffin. After the print is applied to the glass, it goes through a 20 meter long furnace with temperatures reaching 640°Celsius. This results in a complete fusion between the ink and the glass. We then let the glasses cool slowly and the decoration process is complete. Screen printing allows up to eight different colours per glass. For printing small editions, very complicated decorations or for full colour decorations that consist of more than eight different colours, transfer printing is the ideal technique. Sheets of special paper are printed with ceramic ink layer by layer. After being soaked, the ink logos are pasted manually in the correct position on the article to be decorated, whereby the top layer of ceramic ink is released from the paper. The article then goes into the oven, where the decoration is fired into the glassware. Transfer printing is used in the following situations. When printing with organic colours a special ink is used that makes it possible to print in a much larger range of PMS colours. Due to using a very low temperature of about 180° Celsius, it is even possible to print hardened glassware without losing its hardness. This makes organic printing very interesting for certain designs.